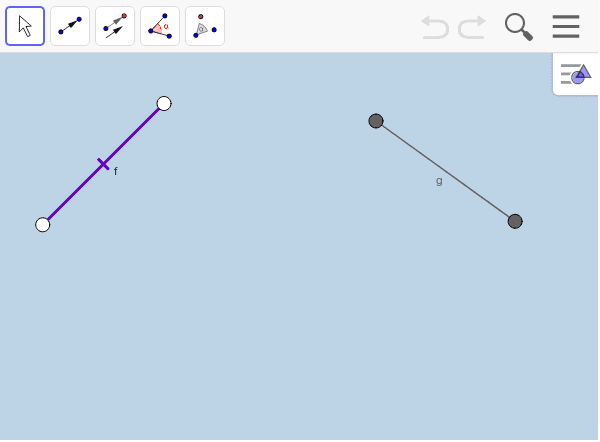 In the applet below, you can construct vectors and angles as well as translate and rotate (using the tools located across the top of the applet). Use the transformational tools available to prove that segment f IS CONGRUENT TO segment g. When you are done, respond to the prompts below. Draw and label a diagram of the series of transformations you constructed in the applet. State how you know segment f is congruent to segment g.
Precisely describe the sequence of transformations that takes one segment to the other. All points, lines, or other objects you may need to refer to in your precise description should be labeled in the diagram you drew. Angle measures and side lengths for equilateral triangles.